President Donald Trump suggested a slew of attempted attacks on top Democrats and other public figures have distracted the media from “talking politics” ahead of the 2018 midterm elections. “Republicans are doing so well in early voting, and at the polls, and now this ‘Bomb’ stuff happens and the momentum greatly slows – news not talking politics,” Trump said in a tweet. At least 14 suspicious packages have been intercepted over the course of the week. All were addressed to prominent Democrats or public figures Trump has vocally attacked and who’ve been critical of the president in turn. President Donald Trump on Friday suggested a slew of attempted attacks on top Democrats and other public figures have distracted the media from “talking politics” ahead of the 2018 midterm elections, saying it has slowed Republican momentum. 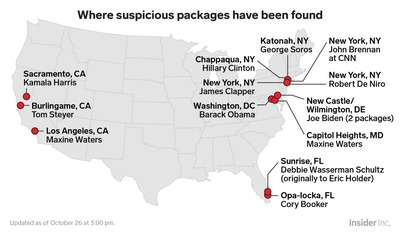 At least 14 suspicious packages have been intercepted over the course of the week. All were addressed to prominent Democrats or public figures Trump has vocally attacked and who’ve been critical of the president in turn.